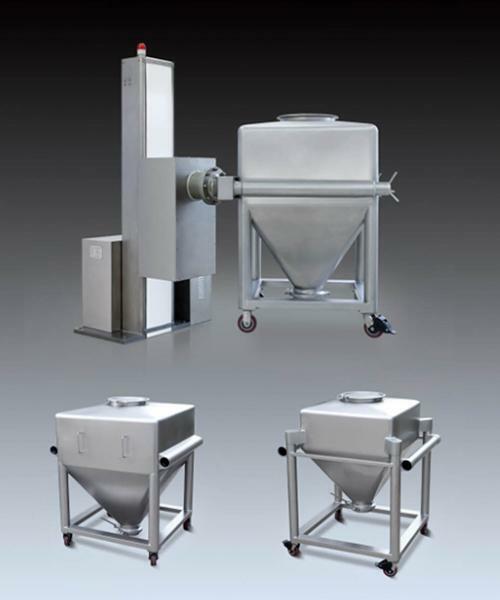 Our HLT post bin blender is extensively used for mixing dry powder with another dry powder, or dry powder with grain in a variety of solid product preparation within the pharmaceutical industry. This mixer can be equipped with hoppers available in various specifications, and it is suitable for mixing a variety of pharmaceutical products and batches, based on technological requirements from large and medium sized companies. Multiple processes can be achieved using a single machine. 1. This bin blender is a high-tech product that has combined machinery, electronics and hydraulics into a single piece of equipment. It is capable of carrying out hydraulic lifting and driving, and features PLC control, making operation and adjustment of technological parameters easy. 2. The control system is highly sensitive, and the entire mixing machine is compact, stable and reliable. 3. A single machine can be equipped with hoppers in different specifications. After mixing, the materials remain in the hopper, which will then be disconnected from the rotating arm and shifted directly to the next procedure, thus improving utilization efficiency and avoiding any chance of material cross contamination, something that is in full compliance with GMP requirements. 4. The mixing barrel can be used as a batching barrel in the upstream procedure and as a charging hopper in the downstream procedure (compressing and filling). 5. The evenness of mixing reaches above 99%, the volume charge coefficient reaches 0.80, and both the inner and outer surface of the barrel are clean and smooth without dead corners. 6. After mixing each batch of pharmaceuticals, the empty hopper is sent to a special cleaning room for cleaning in order to keep the workshop clean.